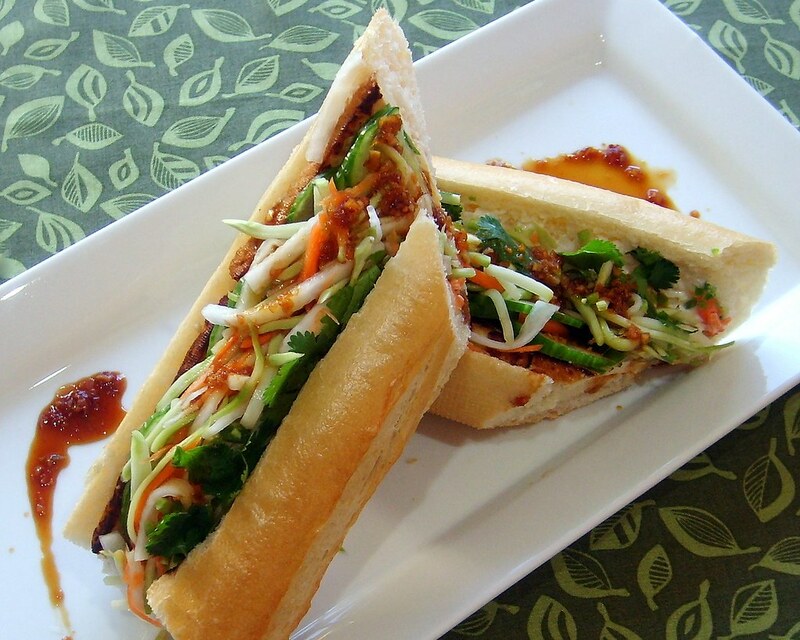 The Vietnamese Banh Mi is one of my favorite sandwiches. I love the contrasting textures of the crunchy vegetables against the tofu, along with the bold flavors of lemongrass with hints of sweet and sour from the pickled do chua. But the baguette is really the star of the sandwich. Luckily for me there is a Lee's Sandwich Shop close to my house and they bake fresh French baguettes every 30 minutes, so I can make Bahn Mi's anytime. If you don't have a Lee's close by, then any French baguette will do. Traditionally, Banh Mi's are made with do chua, which is pickled shredded daikon radish and carrots. But I like adding shredded broccoli to mine as well. If you can't find daikon in your market, then you can substitute any radish, turnips, or cabbage. Whatever you choose it will still be delicious and provide lots of texture. In a large bowl combine all the liquid ingredients, including the salt and mix well. Add the cut or shredded vegetables and toss to coat and place in the refrigerator for at least an hour for flavors to combine. When ready to use, drain vegetables over a strainer to remove excess liquid. Note: You can use Soy Curls, tempeh, textured soy protein, seitan or pre-marinated baked tofu instead of regular tofu. Slice tofu into 2"x4" slices and add to marinade. Toss lightly to combine and marinate in the refrigerator for at least 30 minutes. Drain tofu and pat dry. Heat a saute pan on medium-heat, add canola oil and fry tofu on all sides until lightly golden brown. Set aside. Slice baguettes in half and lightly toast. Rub both sides of baguette with Vegenaise. Place tofu on bottom of baguette and layer with cucumber, do chua, jalapeno and cilantro. Drizzle extra marinade over top and sprinkle lightly with salt and pepper. Serve with extra marinade or soy sauce on the side. Enjoy!